HP Umpire Pat Hoberg ejected Blue Jays Manager John Gibbons for arguing a strike three call in the top of the 4th inning of the Blue Jays-Rays game. With one out and none on, Blue Jays batter Russell Martin took a 2-2 slider from Rays pitcher Chris Archer for a called third strike. Replays indicate the pitch was located over the heart of home plate and midpoint high (px .074, pz 3.461 [sz_top 3.450 / MOE 3.533]), and that all other pitches during the at-bat were properly officiated, the call was correct. 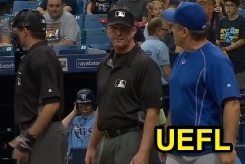 At the time of the ejection, the Rays were leading, 3-1. The Blue Jays ultimately won the contest, 5-3. This is Pat Hoberg (31)'s fourth ejection of the 2016 MLB regular season. Pat Hoberg now has 17 points in UEFL Standings (12 Previous + 3 AAA + 2 Correct Call = 17). Crew Chief Jeff Kellogg now has 7 points in Crew Division (6 Previous + 1 Correct Call = 7). This is the 150th ejection report of the 2016 regular season. This is the 58th Manager ejection of 2016. This is Toronto's 15th ejection of 2016, 1st in MLB & AL East (TOR 15; BOS 6; BAL 3; NYY, TB 2). This is John Gibbons' MLB-leading 7th ejection of 2016, 1st since July 1 (Vic Carapazza; QOC = Y [K3]). This is Pat Hoberg's first ejection since August 10, 2016 (Don Cooper; QOC = Y [Balls/Strikes]). Wrap: Toronto Blue Jays vs. Tampa Bay Rays, 9/4/16 | Video available via "Read more"